La Farola, a symbol of Malaga. Dividing the port area from the city center is a narrow green strip, the Malaga Park (El Parque). Covering some 30,000 square meters, the park has three walkways, fountains, public art and greenery atop re-claimed land. Along the street that runs through the park (Paseo del Parque) are several impressive buildings. 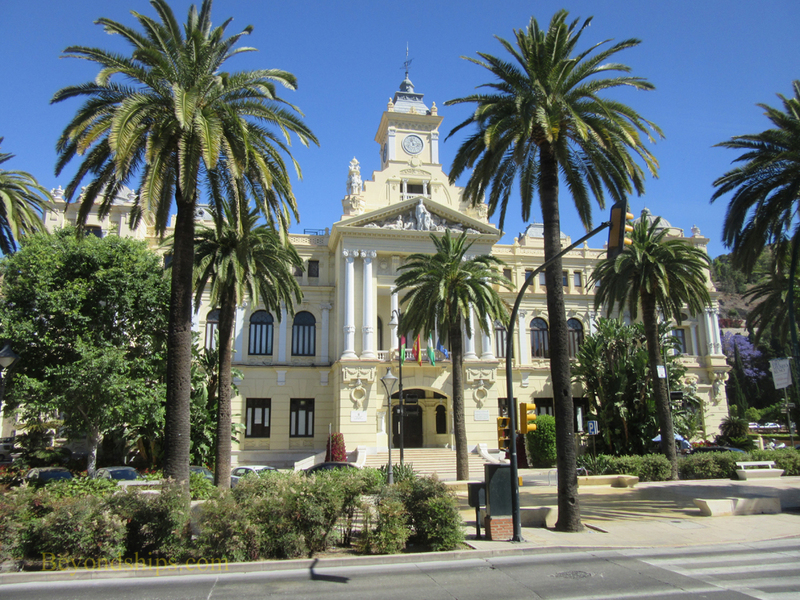 Malaga's Neo-Baroque City Hall was built between 1912 and 1913. It was designed by the architects Guerrero Strachan and Rivera Vera. Lavishly decorated, the building is still used for government and is only open to the public by prior arrangement. The Old Post Office was completed in 1923. 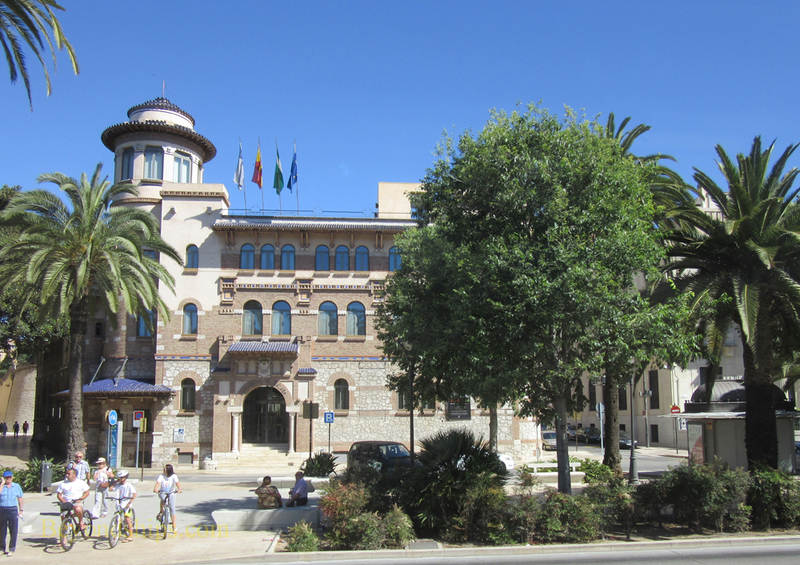 This Neo-Mudéjar style building is now part of the University of Malaga. Fronted by tall palm trees, the Aduana Palace was begun in 1791. This building was designed after Italian Renaissance palaces. Over the years, it has served as a customs house, a tobacco factory and a police headquarters. 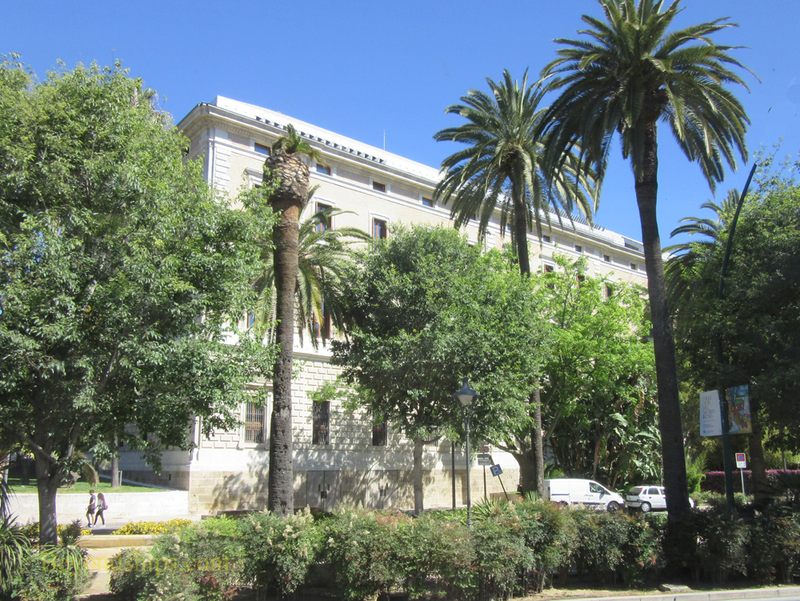 Nowadays, it houses the fine arts collection of the Museum of Malaga featuring 19th century paintings. Below: The Old Post Office Building. 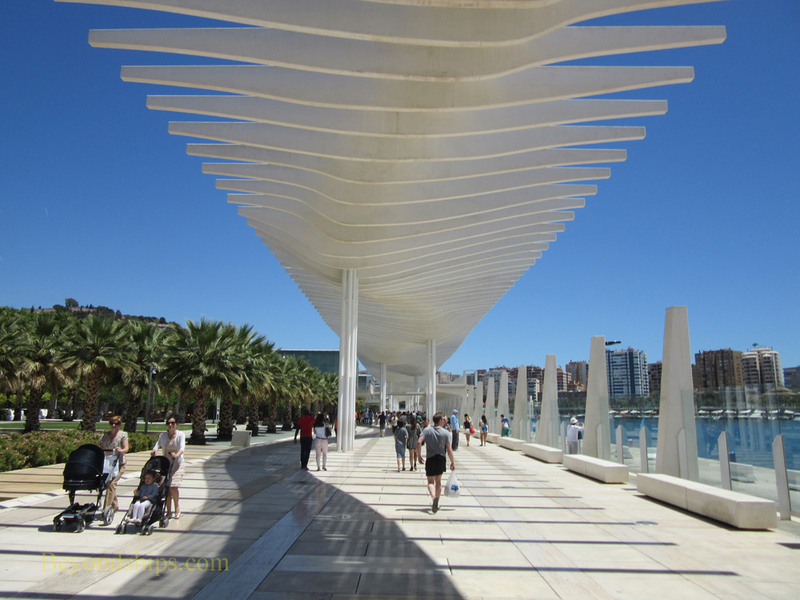 Malaga's traditional harbor has been transformed into an attractive pedestrian-friendly venue. Combining the Palaza de la Marina, the Palmeral de las Sorpresas and Muelle Uno (Pier 1), this area has promenades, public art, restaurants, cafes, shops and museums. It also serves as a pleasant route linking the city center with the cruise terminal. Malaga has the only branch of the Pompidour Center outside of France. 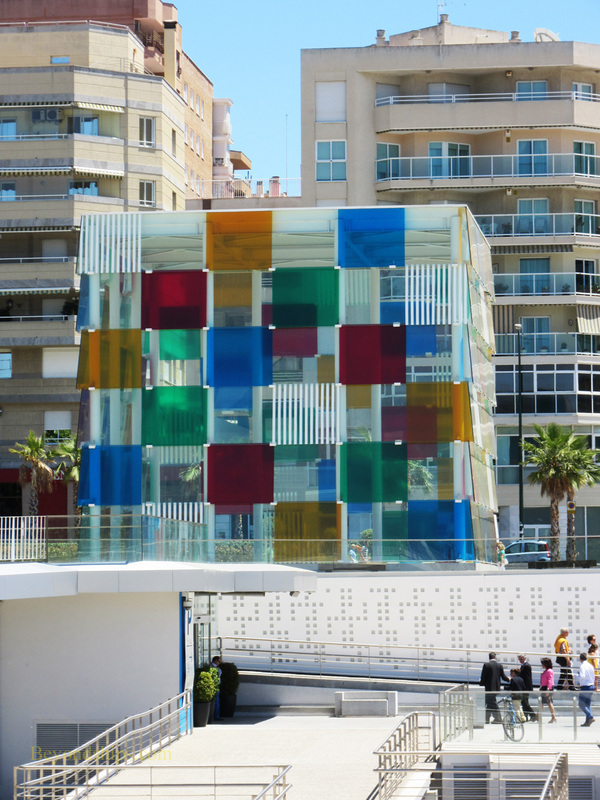 Housed in a colorful glass cube building known as “El Cubo”, the Pompidour Centre Malaga opened in 2015. It contains some 80 works by 20th and 21st century artists as well as temporary exhibits. 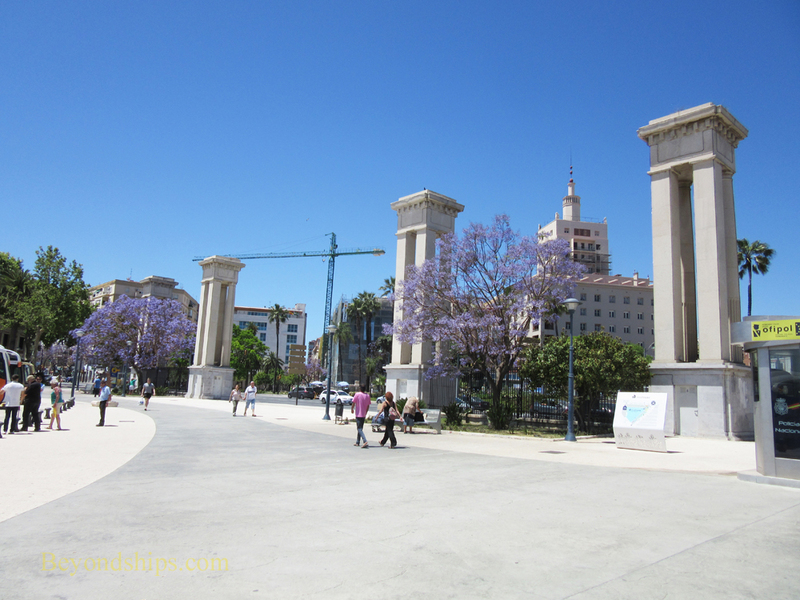 At the end of the causeway linking the cruise terminal to the mainland is Malaga's lighthouse known as La Farola. Built in 1817, the lighthouse was severely damaged in the earthquake of 1884 and was not repaired until 1913. It was damaged again during th Spanish Civil War in the 1930s and was rebuilt in 1939. La Farola has become a symbol of Malaga but remains an active aide to navigation. 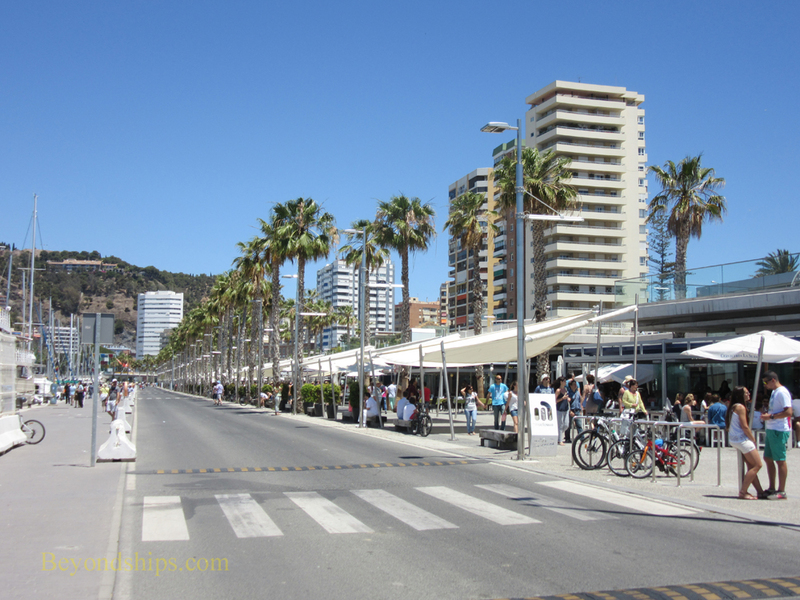 Above: The seaside promenade along Palmeral de las Sorpresas. Above: The Plaza de la Marina. Left: The Pompiduo Center Malaga.